Instant pot pulled pork is insanely quick and makes the best, most juicy and fall apart tender pork of all other cooking methods. Use this instant pot pulled pork recipe for tacos, enchiladas, burrito bowls, quesadillas, pulled pork sandwiches, and whatever else you love pulled pork for. Rub salt, pepper, and any spices of your choice all over the pork roast. Be generous. Select "Saute" on your instant pot, wait for it to get nice and hot, then brown the pork in the instant pot on all sides. Flipping to a different side every couple of mins. Add onions, herbs, garlic and water (or beer or broth, whatever you want to use) to the instant pot. When its all browned, put the lid on. Make sure the lid is in the locked position. Then make sure the vent is set to "sealing" and select "manual" and then add 110 mins on high pressure. Let it do its thing! 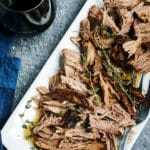 Remove the pulled pork from the instant pot and shred it with two forks. Discard all the fat, and the veggies. If you want to keep the drippings, strain the juices and let the fat come to the top. Put the juices in the fridge so the fat hardens then scoop it off into the trash. Or use a fat separator. We have this one and it works awesome! When the fat has been discarded. Pour a little of the juices all over the meat and use it in your favorite pulled pork recipe. Or store in an airtight container for up to 3 days. For the pork spice rub, use a pre-made spice if you like. We like a Cajun or Mediterranean one, but whatever you choose, make sure it doesn't have salt or make sure to reduce the amount of salt you put on separately. If you want to make your own, we find a blend of chili powder, brown sugar, and cumin works really well for a flavorful rub with a bit of a kick. You can also use herbs and minced garlic.